One of my fellow knotties, Lindsay introduced me to this wonderful dish. Her blog, Love Deliciousness is one of my favorites. I have to post this dish because I know others will like it as well. This dish is easy to make and is easily one of Spencer's all-time favorites. 1. Brown ground beef, drain. Add taco seasoning and tomato sauce. Bring to a boil and then simmer for 20 minutes. 2. In the meantime, cook pasta according to directions. Drain. 3. Mix softened cream cheese and sour cream in separate bowl. 4. Spray bottom of 9x13 pan. Put pasta in bottom of pan. 5. 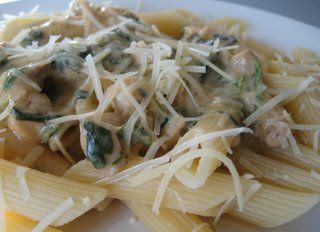 Spread cream cheese mixture over pasta. 6. Spoon ground meat mixture over this. 7. Sprinkle shredded cheese on top. 8. Bake @ 350 degrees for 30 minutes. Let cool 15 minutes before serving. It will easily become one of your favorites too! This salsa is courtesy of Kraft Foods. My best friend's mom made this salsa and I just HAD to know how to make it. 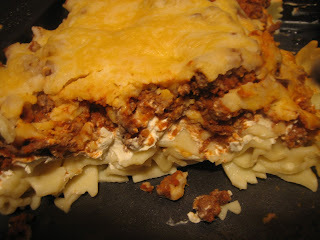 It is of course super easy and super yummy! 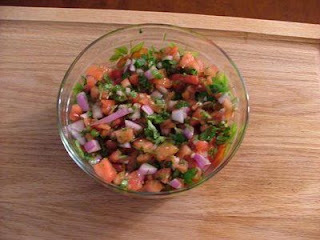 COMBINE tomatoes, onion, cilantro and jalapeno pepper in medium bowl. ADD dressing and salt; toss lightly.